ComputerWorld Thinks BCBSNC Is a Great Place to Work. Here’s Why. Tim Munson never set a career goal of working for an insurance company. 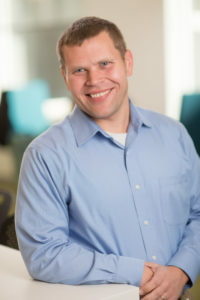 But shortly after arriving at Blue Cross and Blue Shield of North Carolina, he found some unexpected chances to build on his career in information technology. Munson’s discovery rings true for many of the 465 employees in IT at Blue Cross. Their experiences help explain why the company is ranked among the top 100 places to work in IT by ComputerWorld, one of the tech industry’s leading publications. The ComputerWorld rankings came out this week. BCBSNC made the list at No. 19 among midsize employers. The publication cited a culture of learning — led by the company’s Blue University training and development curriculum — along with flexible benefits as top reasons for the ranking. Jo Abernathy, Blue Cross’s chief information officer, says it’s important for IT staff to keep current on a range of technologies, rather than specialize in one area. The company provides the environment for employees to stay up to speed — whether through programs at Blue University, or through informal methods that employees themselves come up with. For example, a program called Applied Learning Alliance gives employees a chance to choose self-paced instruction in 10 emerging technologies like Hadoop and Amazon Cloud. Each course consists of roughly 20 hours of instruction through books, videos and classes over about a two-month period. Another program is called PitchIT. ComputerWorld notes that the employee-led CIO Culture Club sponsors PitchIT, encouraging employees to pitch their ideas on improving quality and efficiency. Abernathy says PitchIT has produced 20 ideas that are being put into place, including improvements in the way file transfers are managed and moving some data warehouse functions to open source. Because competition for IT talent is fierce, especially in the Triangle, Abernathy says it’s important to continually improve the culture of learning and innovation. Employees expect opportunities to contribute their ideas and lead important projects. An effort in the works is to create a physical space called “Innovation Garage” where IT employees can work with business and project leaders across the company. The traditional way of managing IT’s contribution to corporate projects is to wait until the project is officially assigned. The Innovation Garage will help Blue Cross business leaders leverage IT’s expertise, new cloud environments and tools to test ideas for proving value more quickly before going through the corporate project process. The various ways of tapping into employee expertise has a business goal besides attracting and keeping top talent, Abernathy says. Learn more about our company culture and career opportunities by following us on LinkedIn.